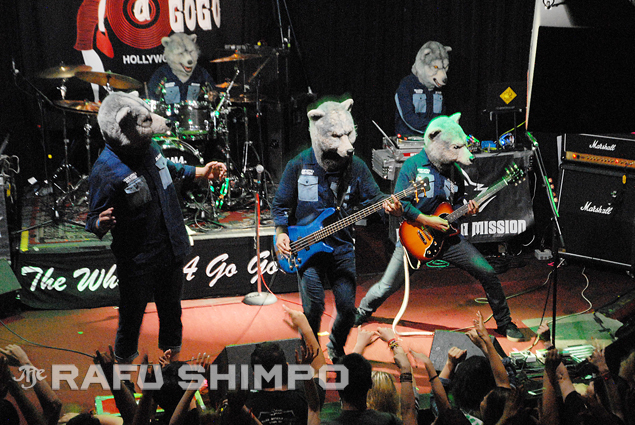 WEST HOLLYWOOD.–Japanese rockers Man With a Mission are rolling their wolverine brand of progressive rock through Southern California this week, with more than a few stalwart fans from home in tow. Michiyo Suzuki took an unofficial hiatus from her office job in Gunma Prefecture to tail the band to their concerts in Denver, San Francisco and Los Angeles, and she’ll be at tonight’s show at Chain Reaction in Anaheim. “I love this band, that’s why I’m here. I’m crazy about them,” she said as she bounced wildly to the thumping rhythms of last Thursday’s show at the famed Whisky A Go Go in West Hollywood. She was one of at least two dozen of the wolf faithful who crossed the Pacific to follow the band. MWAM’s second appearance at the Whisky was the second-to-last stop on their 13-city American tour, one that lead guitarist Jean-Ken Johnny said has been a new experience. A refreshing alternative to the J-pop that is commonly exported from Japan, Man With a Mission is certainly a more turgid, primal – dare I say animalistic – affair, and wholly satisfying for it. Johnny said the band has a full slate of dates to play in Japan over the summer, and this American tour proved considerably more successful than they had hoped.